This Chocolate Cake with Chocolate Buttercream Frosting is indulgent, I know. But it’s a perfect treat for Valentine’s Day! 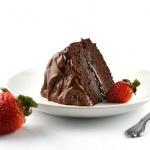 Now you and I both know, really good vegan chocolate cake is hard to come by. And that is precisely why I wanted to do this recipe. You can make the frosting as loose or thick as you’d like. It’s made with vegan margarine, powdered sugar, unsweetened cocoa powder, vegan chocolate chips (melted), vanilla and almond (or coconut) milk. If you prefer a thicker frosting, just add more powdered sugar. For the cake, we used traditional ingredients but substituted some of the moisture that eggs would have added using applesauce. It’s one of my favorite baking secrets for cakes, muffins, etc. We also created our own “buttermilk” using non-dairy milk and apple cider vinegar. Another vegan trick that I cannot live without. 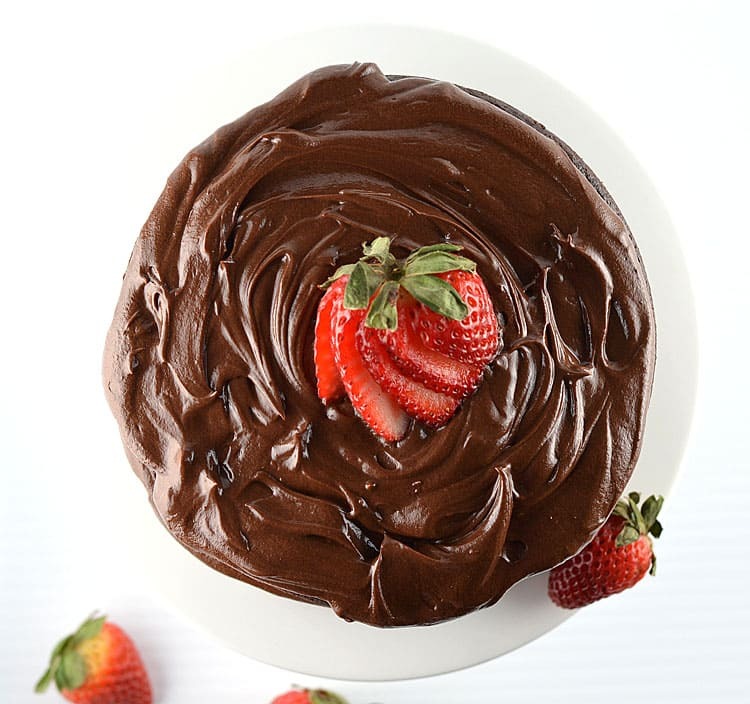 This cake is so simple to make and with a few fresh strawberries, it looks like a million bucks! 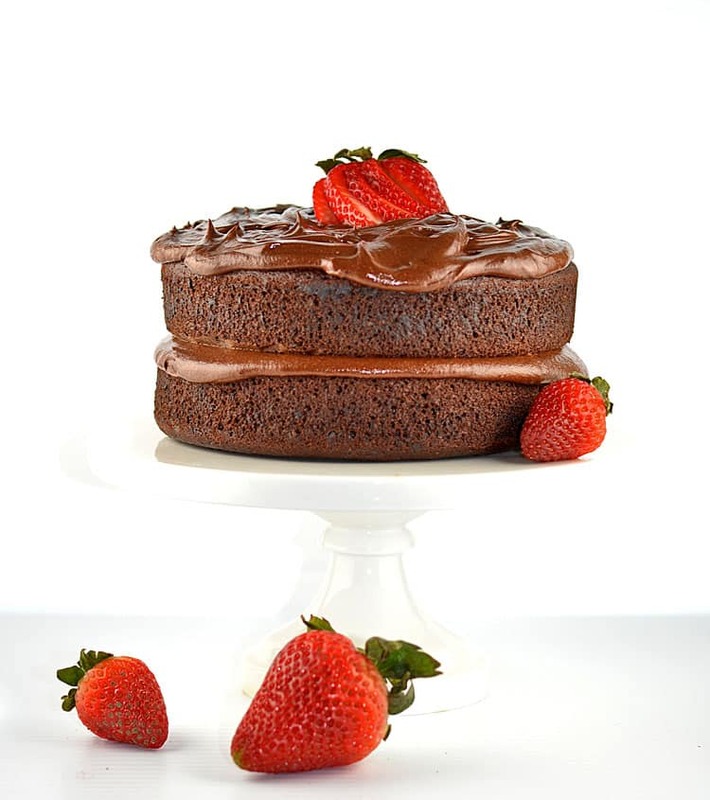 Today, it’s all about the chocolate, but this cake would be really amazing with a cream cheese frosting as well. I did one on my Gingerbread Cake that would work great if you wanted to try that instead. Cut parchment to fit the bottom of two 8" round cake pans. Set aside. In a large bowl, whisk together the dry ingredients. You can also sift if there appear to be any lumps that whisking won't break up. Create the buttermilk mixture by combining the almond (or coconut) milk and apple cider vinegar. Allow to sit for at least 10 minutes. In the bowl of an electric mixer, add the buttermilk mixture, vanilla, oil and applesauce. Beat until well combined. Slowly add the dry mixture to the wet mixture, allowing each addition to blend before proceeding. Beat for 2 minutes on high speed to incorporate some air. Distribute mixture between the prepared pans and bake for approximately 25-30 minutes, or until a toothpick inserted comes clean. Allow to cool in the pan for 20 minutes. 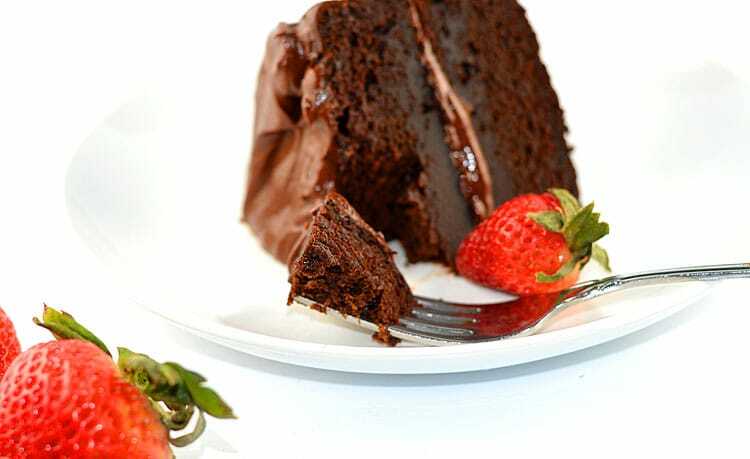 Using a knife, run the tip around the edge of the pan to loosen and assure that the cake will come out without sticking. Invert onto a baking rack to continue cooling. Remove parchment. 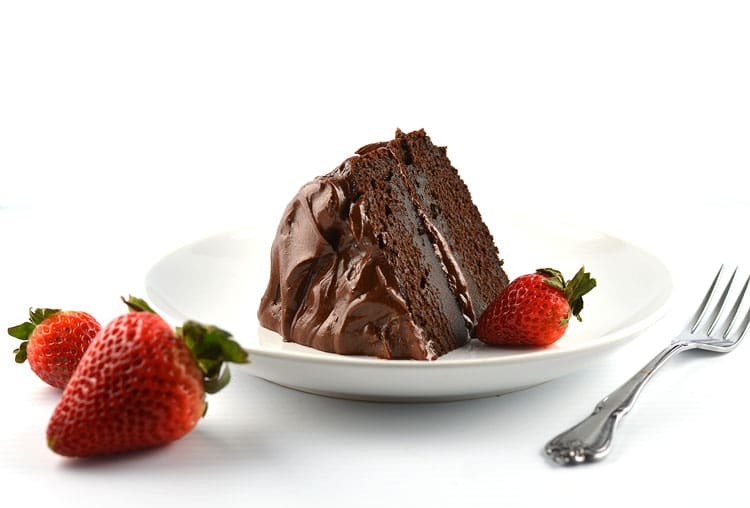 In the bowl of an electric mixer, combine all of the ingredients for the frosting and beat until incorporated. On a cake stand, place the first layer with the rounder side down. Frost the top of this layer. Place the second layer on and frost just the top of this layer as well. A few swirls with a knife to make it look fancy never hurts. Add a fanned out sliced strawberry to the top and serve alone, or with your favorite vegan vanilla bean ice cream. Sorry, but where are the instructions for the frosting?